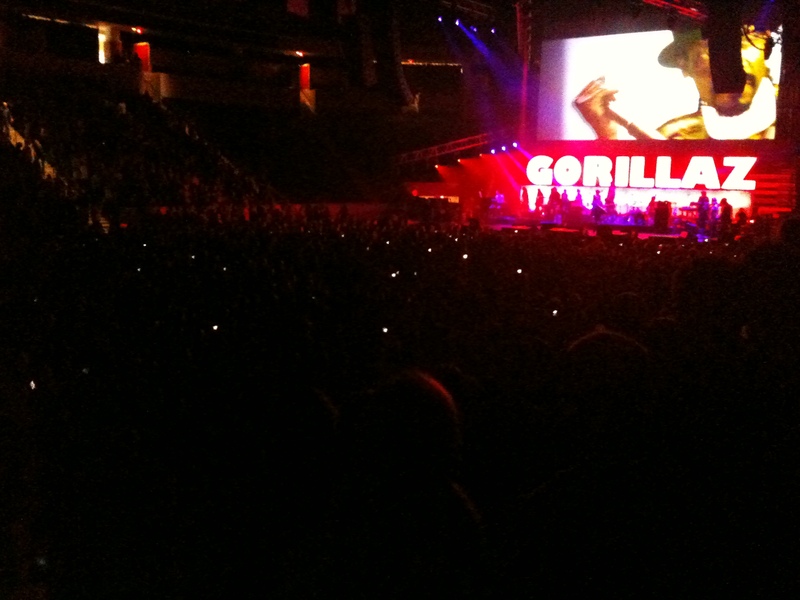 Last night I saw Gorillaz at the Agganis Arena at Boston University. The show was amazing. It’s really easy to find really terrible examples of mixed media performances but when you see one that nails it . . . well, it’s just an amazing thing to see. From the first song – which featured a video of Snoop Dogg on vocals to the last pounding encore Gorillaz wove sound and light and video into an intense narrative. Every little light is a camera or recording device . . . Even though it’s good for the genre, the quality isn’t that good. There are big differences in the quality and experience of the content in these three cases. It makes me wonder, “what’s the logic behind the ban on recording?” Is it to protect the original content? to boost record sales? sell merch? fill clubs? Does the ban – or its unintended fallout (poor quality content) accomplish these things? I have no idea but am curious. For me personally, quality fan content makes me want to experience the band and its content for myself. What about poorly produced fan-generated content? If anything, it may have a cooling effect on someone’s desire to experience a performer. I think of it this way – the low quality content functions as a souvenir. It allows the producer to say “I was there” but rarely conveys much about the quality or experience of a performance. Of course the quality experience is exactly what you want to be conveyed. That’s what builds and excites a fan base. Encouraging fan-content is nothing new. The Grateful Dead managed to become pretty successful not in spite of fan recordings but in part because of fan recordings of their shows. Artists who include their fans in the process of creating a strong content-based community can and do thrive. The best way to create a strong content-based community is to allow fans to create strong content – NOT to force them to create sub-standard content with outmoded restrictions. The idea of not just tolerating – but actively encouraging – content creation shouldn’t be limited to artists. Virtually any brand can benefit from strong user-generated content. Some brands do this well, while others try to exercise control. Control is gone and has been for a while. People will say what they will say whether you want them to or not. The only control that can be exercised is how easy you make it for people to make quality content. Aiding and encouraging content creation (and recognizing quality content) helps connect current fans/customers more tightly to the band/brand/movie/etc. It can also helps attract new fans (how many of you have checked out a band on YouTube based on a friends recommendation or because you’ve heard they’re coming to town?). By putting content restrictions in place all that happens is that poor quality content is produced. These restrictions squander the opportunity to build an engaged fan base, add additional content to multiple channels and reach new people. It’s time for these types of restrictions to be lifted so more people can participate in a positive content experience. What do you think? Do limits on content creation help or hurt? Il Maggico makes a difference! I haven’t posted an Il Maggico video in a while – but getting a note like this makes me want to get back to work. My 5 year old Jack broke his glasses. He was upset that they didn’t have his frames. As the tears were streaming down his face, they put on the magnetic sunglasses that go with his new frames. He smiled and said…”Hey! I look like Il Maggico!” Now he’s happy. Thanks Greg! Amazing – It’s Magic – Wow . . . I might not have had tickets to opening day; but that doesn’t mean I didn’t have any fun (not that this season is starting out fun . . .). I hope that game wasn’t the high point of the season . . .